~~GuRu bHaI~~: Real Wild Heroes ! Craze on Hollywood busters always keep people excited and stay freaky. Supernatural heroes on those flicks make all the impossibilities possible to inspire the audience and they are kind of successful most of the time. With their tremendous adventures and actions, they execute the imaginations of their fans on the screens. Superman, Spiderman, Batman, Hulk, X-men, Avengers and many of these kinds of unnatural personalities are down to earth to safeguard our world from the evils. I have no clue how many times these people save our earth from those immoralities. But still, there is the same scale of excitement with furore when the movies of these heroes are screened. Between, there is an uncommon person who exists in real world but not able to inspire as supernatural humans do. Yes, he is one of the real adventurous human beings on earth. He used to travel almost all possible intemperate places on earth with every possible threat and perturbation over there. He struggles to traverse, to sleep, to find something to eat and in fact to stay alive in the forest or desert or whatever kind of place he has got into. He doesn’t have any supernatural power. He hasn’t born with any extraordinary weapons. He doesn’t know to fly, blow fire, magnetize or in fact he never uses so called technology to survive. He literally fights with nature and stick to apish survival which simply makes us to freeze while watching his life. He does the real adventure when he traverses. He does the real action when he kills his time, scary animals and weird ambiences. He is the real survivor no matter whether the world is fittest or not. 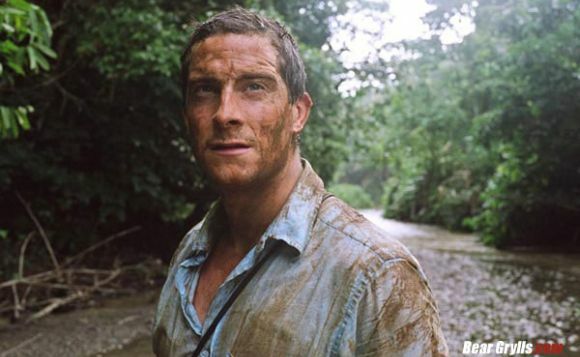 Yes, your guess is absolutely correct and the wild man whom I am talking about is Mr.Bear Grylls who is the enactor of ‘Man Vs Wild’ on Discovery Channel. Yesterday, I was watching one of his episode on a deep African rainforest where he was dying of hunger and so was searching for few fishes on a stream of water with a dim camphor light in the night. Finally, he has caught some weird fishes and cooked them with his campfire and slept in his bushy tent which wasn’t ample to help him out from the heavy rain which showered terribly in the midnight which ended him up completely wet in the morning. Between, there came a break in the show where there was an advertisement for upcoming Superman sequel movie. That made me to contemplate about the personalities which have unfaltering influence on our lives. In fact, expired Aussie wild adventurist Steve Irwin also has inspired me a lot with his bravery involvement in intrepid activities with wild creatures. Unexpectedly, his own passion on wild adventures has killed him. There are many more people like these two who aren’t known to us since we enjoy more in watching people who kill the unsubstantial baddies and safeguard our planet. So, we could also spend at least fiddling time in purveying recognition to these realistic heroes and could popularize them as we do for the sequels of the Tinsel-town superheroes! Worth of rethinking about it ! !